I climb up eight flights of stairs every day to get to my apartment. The first few floors are pretty boring, with the same gates, doors and bags of trash waiting to be taken downstairs, stinking up the hallway. However, on the seventh floor, as I am starting to huff and puff, this poster greets me. It makes me chuckle, and reminds me that I only have a few more steps to go. 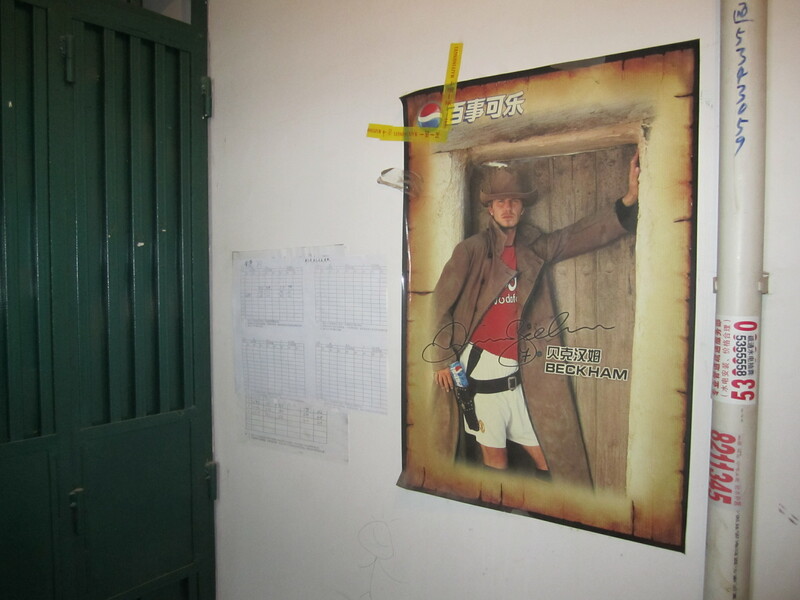 I have no idea why the owners of the apartment have decided to display this strange ad outside their door, and no idea why Beckham thought it was a good idea to pose with a cowboy hat and a can of Pepsi in a gun holster…. I try not to think too hard about it, and just enjoy its quirkiness as it helps propel me closer to home. Eight flights of stairs. Gues I won’t get to see this apt. Your going to have to stay in good physical shape while living there.